(Oklahoma City-AP) -- Fern Holland became the first person today to receive the Heroic Oklahoman Award after death. Holland was killed in Iraq while working to improve women's rights. Governor Brad Henry says the 33-year-old Tulsa attorney lost her life because of her selflessness. Holland's siblings - James Holland, Joe Holland, Vi Holland and Mary Ann Dunn - received the award at the Capitol on their sister's behalf. Henry says Fern Holland's life was an inspiration. She volunteered in a Russian orphanage, lived in a mud hut in Southwest Africa as a Peace Corps member and investigated the sexual abuse of women in Guinea. 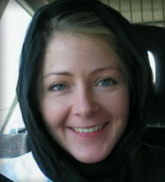 On March ninth, she and two associates were killed by several gunmen posing as Iraqi police officers. ©2004 Associated Press. All rights reserved. This material may not be published, broadcast, rewritten, or redistributed.